Lowongan Kerja PT Bahana Pembinaan Usaha Indonesia (Persero) - BPUI or known as Bahana Group is a raputable State Owned Enterprise (SOE) in Indonesia, which have relation with financial and investment services industry. 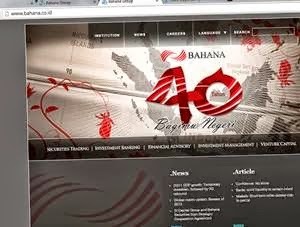 Based in Jakarta, Bahana Group is 100% owned by the Government of Indonesia represented by the Ministry of Finance. Bahana Group now has 4 subsidiaries, namely PT Bahana Artha Ventura (running business in venture capital), PT Bahana Securities (investment banking, securities trading brokerage), PT Bahana TCW Investment Management (asset management), and PT Graha Tata Niaga (office building management). In 2014, the Company’s total operating revenue reported 2.53% down, from Rp 650.40 billion in 2013 to Rp 633.92 billion, while Company’s net profit in 2014 declined by 10.57% to Rp 106.97 billion from Rp 119.62 billion in 2013. Final year university students majoring in Informatics System. Internship / temporary employee for 3 - 6 months. Supporting in each department which is suitable from trainee's background.